As you saw from my last post, the Big Guy and I are in New Zealand. I have to tell you, it is spectacular here, although I was very surprised to find that some of the foraging is pretty similar. It’s autumn, and the trees are groaning with rowan, elder, apples, and the fattest haw berries I’ve ever seen. I wasn’t expecting these plants to be so similar, given how far away it is. I also bought a Forager’s Treasury by Johanna Knox and on looking through, most of the wild edibles are very familiar from a Northern European perspective. Luckily, it seems that most of the poisonous plants are also the same, which is handy. We have also been bowled over by the people here. Everyone has been friendly, welcoming and have gone a little out of their way to be helpful. The lady in the supermarket told us how to get the best bargains, and went the extra mile to find out where we might buy harissa. The petrol station attendant caught us up on the international news and gave us a free cookie each. There Is Such A Thing As A Free Lunch (And Dinner, And Breakfast)! But by far the nicest thing that anyone has done to date is the fisherman we got talking to. 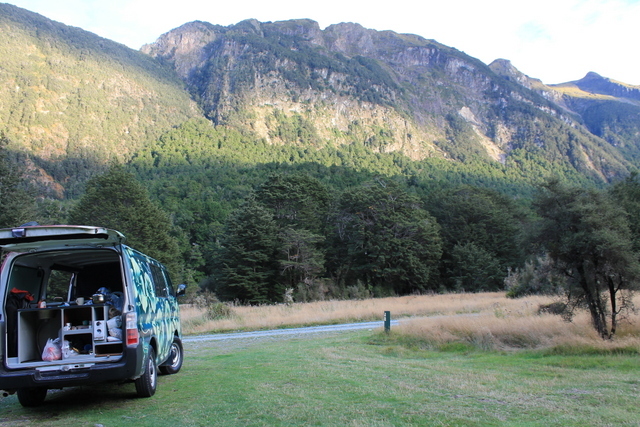 We have a campervan, but in our first days here, we got caught out by jetlag, and simply could not drive onto our intended destination, so we had to book into a motel en route. As is common here, the gentleman in question was friendly and chatty, and we got talking with him over breakfast. It turned out that his parents were both Dutch, so we chatted about the differences in life here and at home. As we were leaving, he tapped on our window and offered us one of his catch. We were stunned, but he very kindly kicked off the gourmet element of our trip with a fresh trout. He had three fresh, and two that were being smoked in a local smokehouse, and he was heading out that day to get some more. This was no small fry, either. 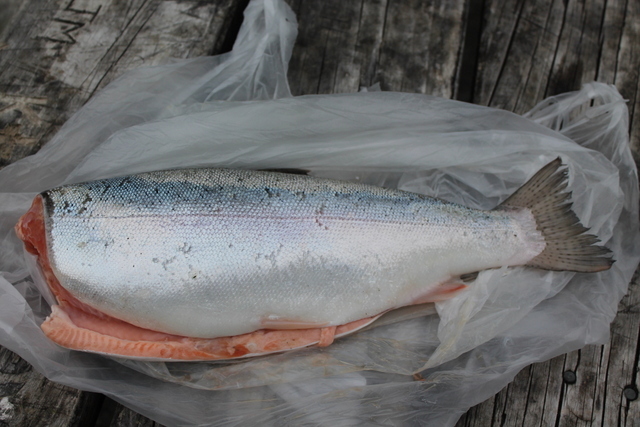 He gave us the smallest of his catch, but it still weighed in at just under 3 kg. It really was beautiful. I spent the entire day thinking about how I was going to cook that trout. My foraging book was helpful, because it mentioned that wood sorrel can also be found here. 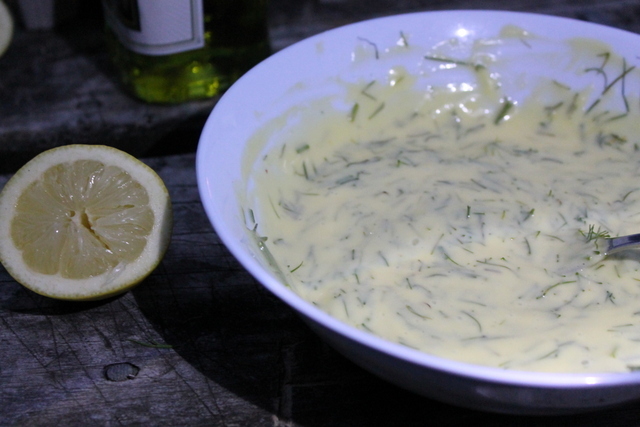 So, I planned to look for some, and make a cream and sorrel sauce to go with the trout. 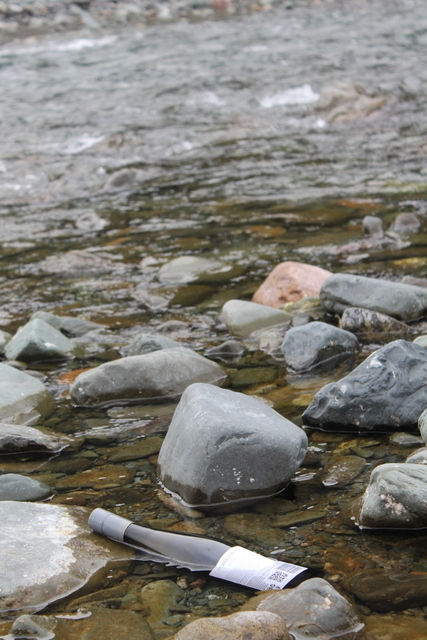 Unfortunately, where we had chosen to stop for the night, on our way to Milford Sound, offered up no wood sorrel. We had chosen it specifically because we could barbecue there. Luckily, I had a back up, because I had the foresight to buy some dill when I stopped at a shop for potatoes. So, a plan was born, for a gourmet meal, made with basic equipment, to be served under the Southern stars. 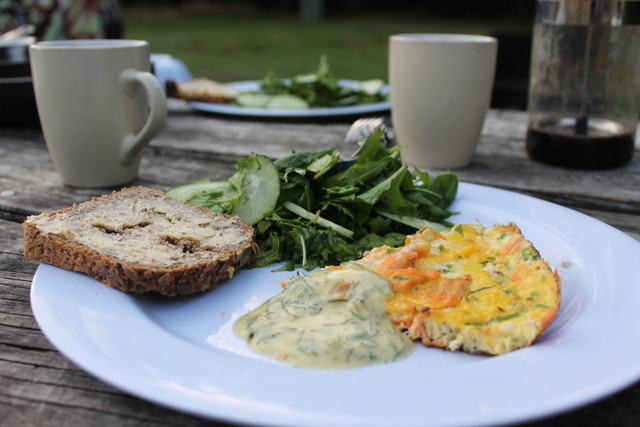 We have eaten many gourmet campsite meals since; including succulent lemon and pepper lamb, venison and mushrooms, and even shakshuka for breakfast. But that trout, which served us three hearty meals, plus a little more to pick at was the nicest. 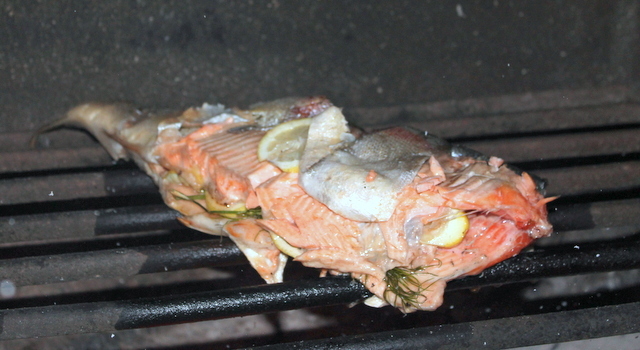 The first night, we barbecued the trout and served it with a green salad with mayonnaise. 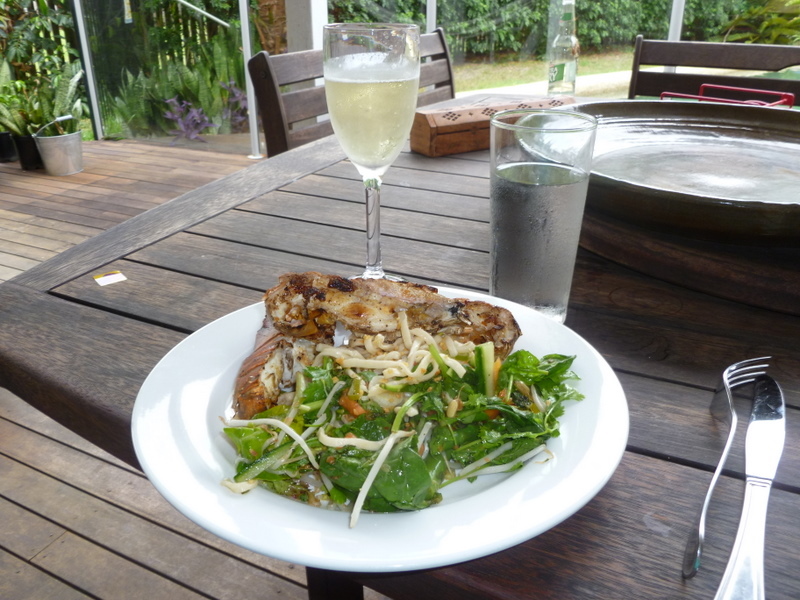 Served with a nice local Riesling, that we had cooled down naturally. The the leftovers kept nicely in a couple of ziplock bags in the cool box (which also had a big bag of ice), and made excellent omelette, and went nicely with pasta in a creamy sauce, with more dill. You can’t get more gourmet, or more generous than that. Thank you very much, kind stranger! Wash the trout and pat it dry with kitchen towel. Season the cavity of the fish with salt and pepper, and put the dill and lemon slices inside. Barbecue for about 40 minutes on a camp barbecue that is too high off the coals. If you are doing it on the barbecue at home, then you can put the fish closer to the heat source, and so it will take less time. Turn once during cooking, so it cooks well throughout. I have previously only made mayonnaise with a balloon whisk, so I was worried the fork would take ages. Now I’m sure this won’t work if you are trying to whisk egg whites for meringue, but the simple fork makes surprisingly speedy mayonnaise. Whisk together the lemon juice, egg yolks and a little salt. Gradually add the oil. 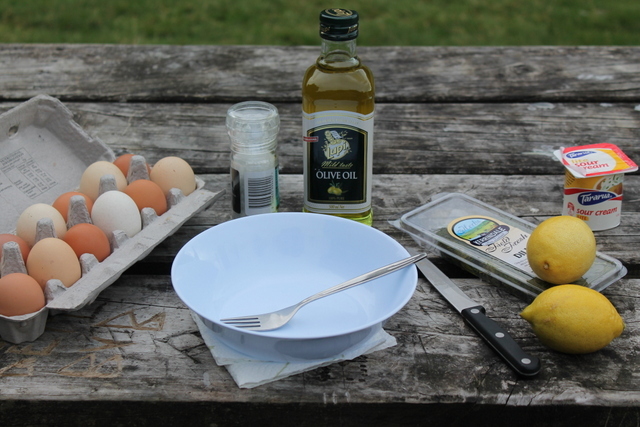 My tip is to add a little, then make sure it is thoroughly whisked into the egg before adding more. This way, the mayonnaise is less likely to split. Once the mayonnaise is thick and glossy, taste it. You may need to adjust for seasoning, and possibly add more lemon juice to get the right balance of flavours. Finally, chop up the dill. As I said, I resorted to some scissors, because the knives I had were less than sharp, but you chop yours however you like. Add it to the mayonnaise and mix well. 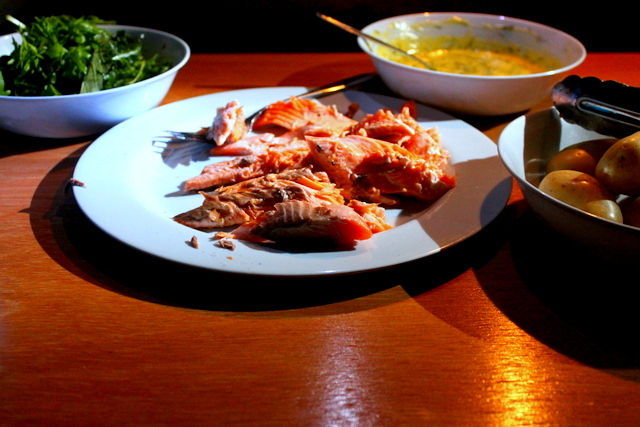 Serve the fish with a nice green salad, some simply boiled potatoes and a lot of the mayonnaise. Best served under the stars, but this is still good, even if you are forced inside by the weather. We are in Australia. Posting may be sporadic, but I do want to do my Christmas dinner, and custard based recipes. 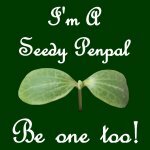 I may well leave the acceptable way with sprouts post, that I have not really written yet, to next Christmas now! Anyway, this year we are having Christmas by ourselves in Cairns. An Aussie Christmas has to have seafood, and should also include a barbecue somewhere in the proceedings. We were very lucky indeed, and also had access to a pool and an entire rainforest to ourselves, since no one else was about. All in all, it was a pretty brilliant day. 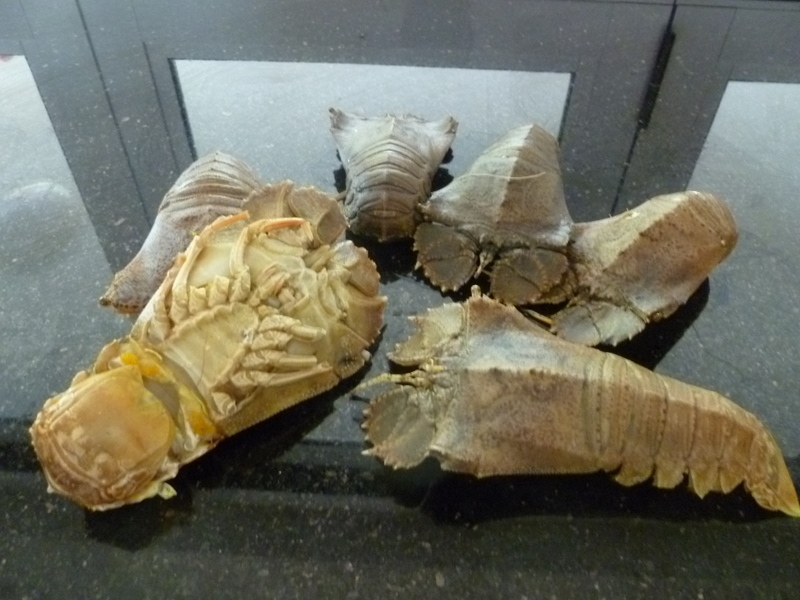 We were lucky enough to get hold of some Moreton Bay Bugs, which are actually a kind of slipper lobster. Most Moreton Bay Bugs are caught as by-catch from the prawn and scallop fishing industries, both of which are trawled for. Trawling is a highly destructive practice, resulting in a lot of unintended species netted (bycatch) and destruction of the sea bed. The Australian Marine Conservation Society urges you to ‘Think Twice‘ before eating them, largely as a result of the catch method involved. We found a fish market that claimed that they were sustainably caught. It is possible to scuba dive for these, as it is for scallops, but these are very difficult to find. Anyway, if you do get them, you need green (uncooked) bugs if you want to barbecue them. They cannot live long out of water, and spoil much quicker than crabs or lobster, so this may not be easy. Never reheat them, so if all you can get is cooked, just eat them cold. In North Queensland, fresh (and ripe!) tropical fruits are sold all over the place. They are cheap and plentiful. I had been thinking that mango, papaya, chili and lime would be perfect partners for the sweetness of the bugs, which naturally leads you to Thai flavours. They typically use green papaya, and I only had ripe, but I made do with what I had. I hope that I am not one for boasting, but the result was really good. I was very proud of our tasty little Christmas Dinner. I have given the recipe below, but if you cannot find Moreton Bay Bugs, you could substitute with scallops, langoustines, or even lobster if you are feeling decadent! Just please check out how they are caught, and try to get sustainably caught and managed fish where you can – the ocean is an important source of food for us, and keeps a lot of communities going, but only if we look after it well. Something which is sadly not happening too much these days.Your local Marine Conservation Society can help give you an idea of fish stocks and some sustainably managed areas (although their system is not perfect). If you don’t have this, then organisations like Greenpeace can tell you which species to avoid altogether. If you can’t or won’t get any of these, just have the salad – it is really tasty on its own. Make the salad dressing. Mix the lime, fish sauce and the sugar, until the sugar has dissolved. Mince the garlic using your knife, deseed the chilli (or leave them in if you like things really hot) and chop it finely. Chop the coriander stalks and mint leaves as finely as you can. Add all of these to the lime mix, and taste for balance, you may need to add a touch more lime or chilli, to your taste. Set aside for the flavours to develop. A short period of time in the freezer should be enough to kill the bugs humanely. Slice the bugs in half, lengthways, with a sharp knife. You will then need to clean the digestive tract and the head. Make the salad, by mixing up the salad leaves, a good bunch of coriander, a handful of mint leaves, and julienned cucumber and papaya. Wash the beansprouts well, before adding them, and blanch the asparagus, and cut the stalks into 3-4 pieces, on the angle. I would also have added grated carrot, but we managed to lose the carrots somewhere between the shop and home, so no carrots for us. Mix together well, and set aside. Oil the flesh of the bugs, with a squeeze of lime, and place on a hot barbecue, flesh side down for about 8 minutes. Then flip them to colour the shells. They are done when the flesh becomes opaque. Meanwhile, make the noodles according to the manufacturer’s instructions. Thinly slice the spring onion and the chilli and add to the vinaigrette. I had a very simple lime vinaigrette left over from the previous day’s lunch, but you can make up your own with 1 part lime juice to 3 parts olive oil. Leave the chilli and the onion to macerate to take the raw edge off them. When the noodles are cooked, drain, and pour over the vinaigrette, and mix well, so that the noodles don’t stick. When everything is cooked, dress the salad with the dressing you made earlier, and toss together well. Plate up the noodles and the salad, and sprinkle with chopped, unsalted peanuts. Serve with the warm bugs, and a cold glass of wine. Next to a pool in the tropics, by preference.